I’ve been feeling a bit at loose ends lately. Boat life is fine. Work is picking up speed. I run. I cook. I watch tv. But it’s all been getting a bit routine. So I decided I needed to get out of town and do Something Officially Interesting. Thus it was that last Saturday morning I set the alarm and got a train to Canterbury. 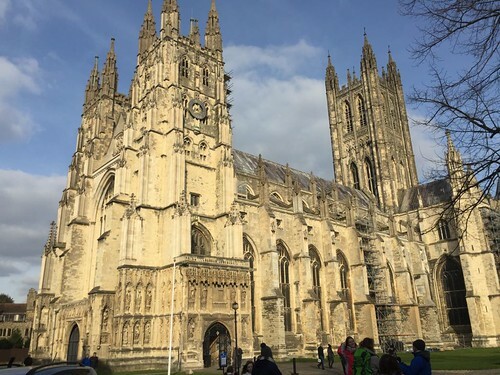 Astute Go Stay Work Play Live readers will of course know that Canterbury is famous for its cathedral, which is the seat of the Archbishop of Canterbury, the head of the Church of England. As such it’s considered the Mother Church of the Anglican faith worldwide (that's Episcopalian for anyone tuning in from America). It’s also a World Heritage Site, the location of the martyrdom of Thomas Beckett in the 12th century, a rather well-known site for Christian pilgrimage in the Middle Ages, home to the tomb of the Black Prince, adjacent to the quite posh King’s School, and conveniently down the road from a Pret A Manger (of course). So it was clearly going to be easy to make a day of it. The history of Christianity in England began when Augustine was sent by Pope Gregory to convert King Ethelbert in 597 AD, at Canterbury. Of course the cathedral as it stands today came along much later. Apparently at first they simply reused an old Roman church, because of course there’s always some kind of Roman connection in this part of the world. Always. Really, if you go somewhere in south-east England and don’t come across a Roman archeological site you must have chosen a very dire location indeed if even the Romans shunned it. Like possibly Willesden Junction. Anyway, back to the cathedral, which in its present form was build between 1070 and 1077, though alternations and additions continued until 1834. Let’s just pause for a moment here. Did you catch those dates? Started in 1070! LOOK AT THIS PLACE. This was built a THOUSAND years ago. Are you kidding me? 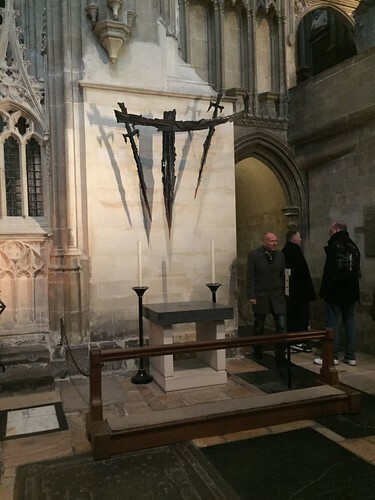 I am now obliged to tell you about the martyrdom of Thomas Beckett, because you’re not allowed to talk about Canterbury Cathedral without talking about Thomas Beckett. (That stricture is actually in the Magna Carta. Little know fact.) (Also not actually a fact.) (Also apparently we don’t call him Thomas À Beckett anymore. I don’t know why. You have Google. You figure it out.) Thomas Beckett was the Archbishop of Canterbury in the late 12th century, and was not best favoured by King Henry II, possibly because Thomas excommunicated Henry, which, to be fair, would probably tax the patience of even the most saintly of monarchs. So you can maybe understand why Henry was sort of pissed off at Thomas and uttered some version of the famous quote “Who will rid me of this troublesome priest?” Four of Henry’s knights, on hearing those words, interpreted them as a royal command and travelled back from exile in Normandy to Canterbury where, on the evening of December 29, 1170, they assassinated Thomas Beckett inside the cathedral at a spot now known as The Martyrdom. Here’s the castle. It’s near the site of the original Norman motte and bailey built soon after the Battle of Hastings and replaced with this stone keep in 1123. Sadly, while “motte and bailey” sounds a bit like an obscure cocktail (As in: “Barman, I’ll have a Motte & Bailey please. And don’t scrimp on the Motte!) it’s actually a primitive fortification. A motte is a large mounded earthwork with a fortification on top, and the bailey is an enclosure nearby. Quick to build with unskilled labour, they were a popular first step when securing territory. Think of them like a medieval conqueror’s starter castle. And because touring the castle and walking into the centre of town didn’t chill me enough, I then cleverly elected to do a 90 minute walking tour around the town. Astute Go Stay Work Play readers will remember I’m a big fan of guided tours, and the train arrived just in time for me to catch this one, which I thought would be a nice lead-up to the cathedral. I joined the walking tour guide Karen at the Buttermarket - a square outside the main gate into the cathedral enclosure. Karen was of course relentlessly cheery and full of interesting tidbits of information. 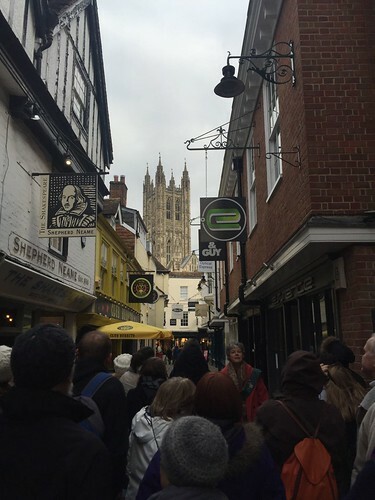 She led us through Canterbury's lovely old medieval streets, pointing out many of the surviving Tudor buildings with stout oak beams and second storeys that jut out over the pavement. 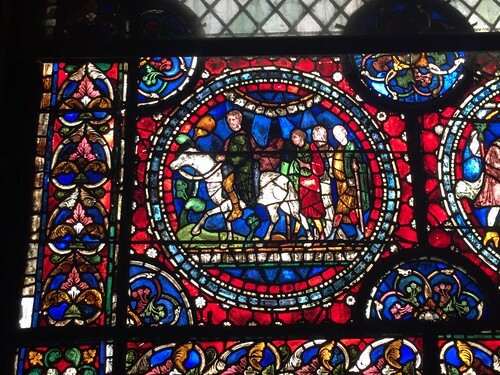 One of the main Tales-related attractions in Canterbury (besides the cathedral itself) is a very touristy offering called, with singular lack of imagination, The Canterbury Tales. Having taken that whole university course on the Tales, I felt this version might not have quite the level of scholarly rigour that I would find satisfying, and, based on the website, would include wax figures, costumed actors, scratchy audio recordings and, terrifyingly, the very real possibility of some kind of audience participation. Also the admission price was £9.75, which is just 75p shy of the actual cathedral’s admission cost and about £9 higher than what might be appropriate. Instead I elected to spend my money on a very nice lunch of local cheese and toast, a chocolate flapjack and several cups of coffee, and did not regret my choice for a moment. 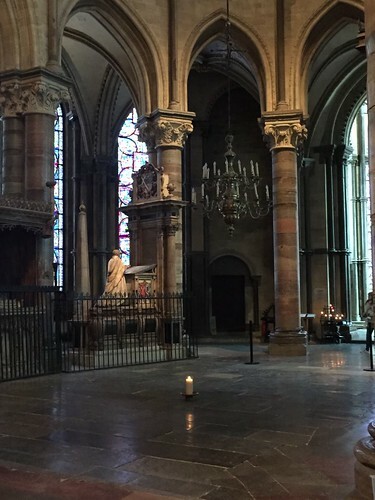 I didn’t do the guided tour of the Cathedral, but I did buy their small printed guidebook and, after a short break to restore feeling to my fingers and the tip of my nose after reaching the sheltered warmth of the actual cathedral, I wandered slowly through, starting in the nave. The nave. 178 feet long, 71 feet wide and 80 feet high. Again... built in the ELEVENTH CENTURY. Of course it’s stunning. It’s a mix of Romanesque and Gothic styles, which means it’s got some round and some slightly pointed arches. It’s full of slender columns supporting fan vaults, and the outside walls have lots of stained glass and small side chapels, and there’s a beautiful quire with ornate wooden carved benches in the central crossing. The tour also goes into the crypt, with a much lower ceiling, heavy columns and short round arches supporting the massive weight of the central bell tower above. The crypt was also mercifully equipped with several commodious window ledges in front of which were piping hot radiators, so I lingered a while to soak up the ineffable mystery of whatever and thaw out a bit more. Look! Pilgrims on the road to Canterbury! And this candle marks the spot in the sanctuary where Thomas Beckett's tomb was during the height of the pilgrimages. It used to be a gold-plated bejewelled shrine, but Henry VIII took care of all that, destroying it and Beckett's bones in 1538. A circuit of the cathedral was enough for me, because I returned later in the afternoon to attend the evensong service in the quire itself. This was not out of any sense of religious obligation (being the godless heathen I am) but simply because it’s a perfectly lovely way to see the church as it was intended. 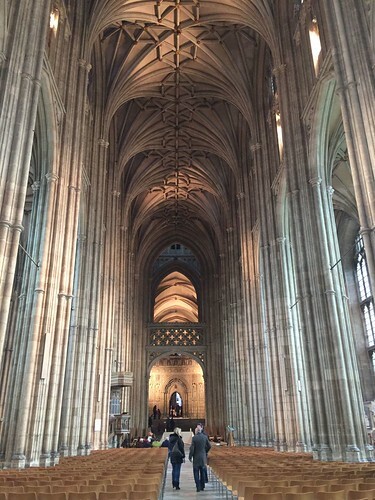 Plus they have a fairly well-known boy’s choir, and the service was only 45 minutes long and the seats were padded and you can spend a lot of your time staring upwards contemplating the ceiling. It was all very nice, until I realised that I hadn’t made any provision to put something in the collection plate when the time came, meaning that I was left scrabbling in my backpack to extract the only thing I had in my wallet - a ten pound note. This irked me at first and then I reminded myself that £10 is a paltry sum indeed to enjoy a live choral performance in a thousand year old architectural miracle that probably could use an extra few pennies to stop itself from crumbling into dust. I left feeling very satisfied and spent another hour or so wandering through the streets until it was getting close to dusk. I started back to the train station, but not before exploring this diverting park near the city walls. 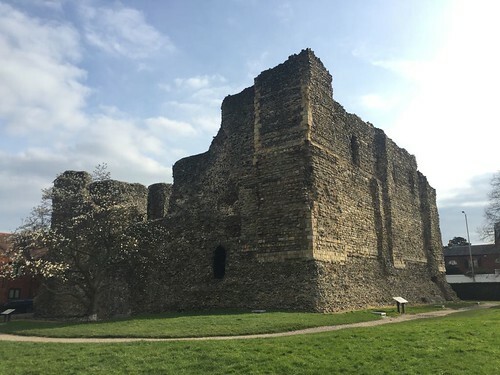 (Of course Canterbury has long sections of Roman / medieval city walls that survive to today.) 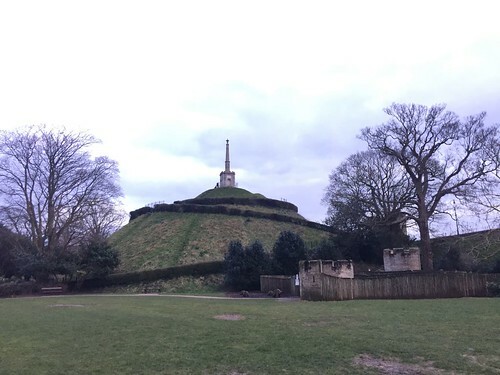 Dane John Mound is an artifical mound that started out as a Roman burial ground, then became the site of the original motte from the Norman conquest. Now it's a nice lookout spot. Having come full circle, it was a short walk back to the train station and a slow but warm train back to London, during which I managed to complete the Saturday Prize Crossword. And later when I got back to my chilly little boat I was able to get the temperature back up to toasty in record time. So really, not a bad day out: gorgeous cathedral, local cheese, hot coffee, nice singing, a proper motte, a successful crossword, and no digits lost to frostbite. And GSWPL number 132 posted. Things are going well on my little boat, as you’ll see later in this post. However, that doesn’t mean it’s all been smooth sailing*. I spent about ten days moored up at Willesden Junction recently. Extremely astute former Go See Run Eat Drink readers will remember Willesden Junction as my first home in London, back in August of 2010 (!). It’s a particular unloved neighbourhood, but the canal is close to the tube and it’s got basic services and it’s not hard to find mooring space there. I wandered back up to my old stomping grounds after tying up and spent a few minutes checking out the old ‘hood. Sadly it is - brace yourself - even MORE of a shithole than it was five years ago. Which I am sure we can all agree must have taken some concerted effort on the part of the residents, the Council, and anyone who has passed through. More shuttered shops; fewer actual services. Unless you want a place to get hair extensions, buy fried chicken, or place a bet you’ll struggle. Clearly the hipsters have not discovered Willesden Junction yet. No mind though, it served its purpose for me, which was to provide a convenient mooring location where I could leave the boat while I was on a weekend trip to Bruges for a few days of running with hashers and drinking Belgian beer. I felt ok leaving the boat because I’d made friends with a guy on a nearby boat and because I kind of need to get over the slightly queasy feeling of locking up the hatch and leaving the boat behind and having a very tiny suspicion that it won’t be exactly floating or even exactly still there when I get back. Moored at Willesden Junction. Beautiful scenery, I’m sure you’ll agree. The Powerday warehouse is particularly stunning at sunset. So off I went to Bruges and ran around that beautiful city and drank a lot of really lovely beer and toured a brewery and ate chocolate and frites and moules and generally had a very nice time. By the time the Eurostar pulled into St. Pancras Station on Sunday evening I think we were all done in, and I still had the schlep to Willesden Junction ahead. And of course there were engineering works on the Bakerloo Line which meant I had to get off two stops before my destination. And of course it was raining and windy. An of course at this point I abandoned all forms of public transport, because there are fewer more dispiriting phrases in English than “Buses on Rail Replacement Service”. I took a quick taxi back to the towpath and found my boat just where I’d left it. 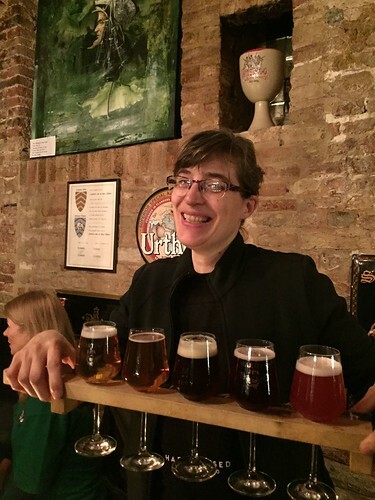 Me and a flight of Belgian Beer. Oh yeah, they have things figured out over there! Oddly, though, there was another boat moored against the Lucky Nickel. Double-mooring is when a second boat pulls up alongside a boat moored to the bank and ties up alongside. 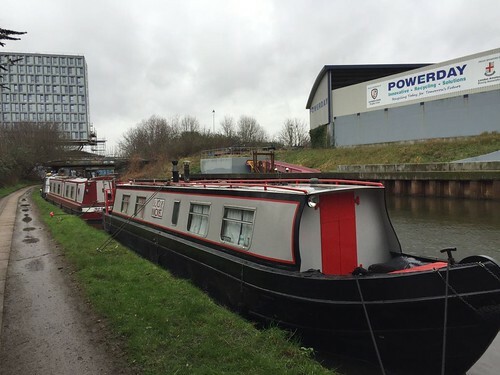 This is quite common in the more popular spots in London, because the amount of prime mooring space is much smaller than the number of boats in the system, but to find a stranger double-moored in the grim wilds of Willesden Junction was a bit surprising. I was momentarily annoyed, but had more pressing matters to deal with because the stove had been out for two and a half days and the temperature in the boat was slightly above seven degrees. I spent the next while getting the fire going again and waiting for it to catch well enough that I could bank it up and get some sleep. 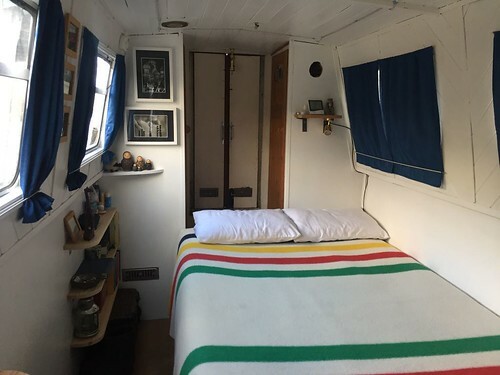 I finally got to into my chilly bed at about midnight, with the rain and winds increasing, and the other boat knocking up against mine about every nine seconds as it was blown around. Not the ideal recipe for a quiet night, but little did I realise exactly how not quiet it would be. About three hours later - at 2:50am, to be precise - I was woken by a most unholy crash from the other end of the boat. When I got up to investigate I found my wall-hung kitchen cupboard could no longer accurately be described as wall-hung, since it and all its contents were now jauntily strewn about the kitchen floor, wedged between the two counters. On the plus side, the temperature in the main cabin was quite cozy by this time, so at least I was comfortable for the hour and a half it took me to gently pick my way through the broken wine glasses and the scattered canned goods and get the cupboard sort of back into place. 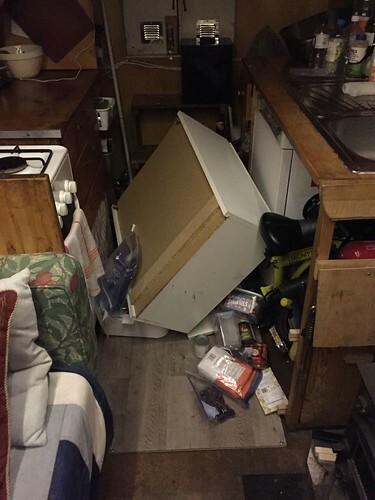 For the first while I loudly cursed that mysterious double-moored boat, whose incessant knocking had obviously caused the cupboard to leap to its death. Then I looked a bit more closely at the brackets from which the cupboard had been hung and quickly redirected my mutterings to whatever mouth-breathing moron hung those brackets from a grand total of four tiny half inch screws sunk into thin and suspiciously ill-supported decorative tongue-in-groove siding. I was reminded of when I owned an old house in Winnipeg and regularly muttered imprecations against the former owner for some inexplicably bizarre “home improvement” decision he’d made. And then I sighed, and rested the cabinet on the counter, securing it with four very long screws into the substantial stern wall of the boat, and a steel bracket for good measure. And then I went outside and tightened the ropes on the offending boat so that I might be able to get a few hours sleep, and poured myself a large glass of port and retired to my bed once again. So that was last week. The cupboard is fine now, still resting on the counter, and now with its forward door bolted back on, because of course the screws in the hinges pulled right out of the particle board on impact. And while I did lose a little metal-and-mirror side cabinet I’d been using for storing spices (bent and damaged beyond repair), I have to admit that having the cupboard a bit lower is kind of convenient. And it’s all temporary anyway, because there’s no way that cupboard will still be in that kitchen once I finally get it all sorted out. And how about some GOOD news on the boat renovation front? Because I’ve got that too! I spent much of my time in Willesden Junction working on the bedroom, and I’m really pleased with the results. The ceiling and walls have been painted white, so it’s much brighter. 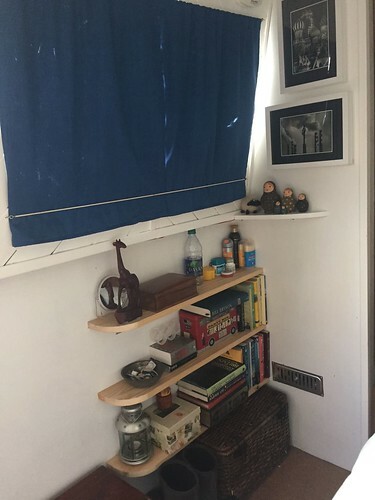 And I dismantled some old shelves and trimmed them down with nice curvy corners and re-purposed them by hanging them from the wall (with nice chunky steel brackets and proper screws, I might add…). Having stuff up off the floor makes a difference, and using much narrower shelves beside the bed means that I was finally able to unstack the two narrow mattresses and reconfigure them into a lower, wider version that is much more comfortable and grown-up. 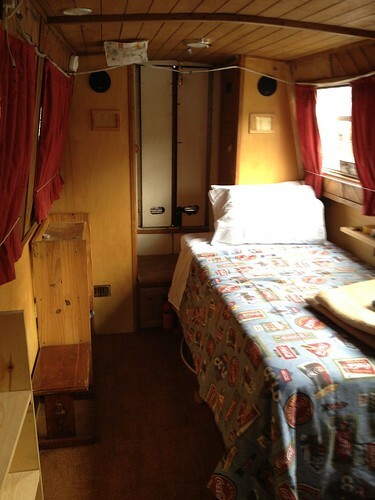 Here’s a picture of the bedroom last year. See? Wall-hung things that won’t abandon their posts at the slightest tap! And here it is looking the other way. Seeing what a difference a bit of paint and some other small, easy changes makes is hugely satisfying and reassuring. 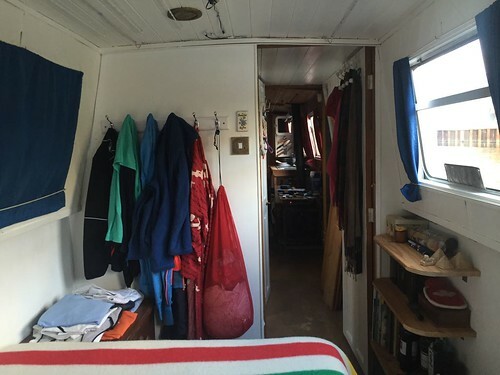 Now I can look at my bedroom and imagine what it'll be like when the whole boat is more like this. I've still got miles to go, but at least I've started down the road and it feels great. * P.S. I had a few suggestions about what phrase one could use to describe the act of moving the boat when "sailing" and "driving" both didn't seem quite right. "Manning the tiller" was suggested, as was "under way" but I think the one I prefer it "piloting". Thanks, PW!